According to the latest market report published by Transparency Market Research, titled “PET Bottles Market: Global Industry Analysis, Size, Share, Growth, Trends and Forecast, 2018-2027,” cost-efficient packaging solutions offered by PET bottles for carbonated drinks, juices, packaged water, and others are expected to boost the global PET bottles market during the forecast period, 2018-2027. 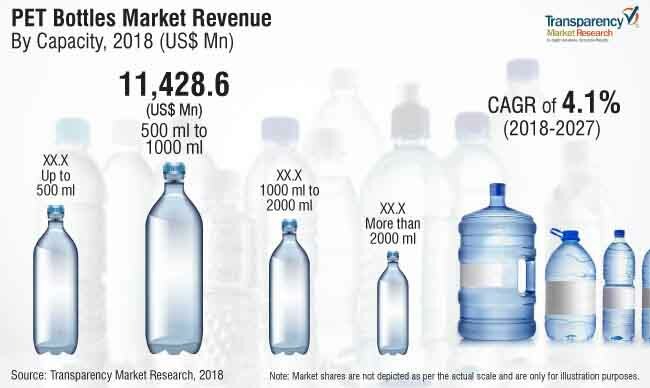 Globally, the revenue generated from sales of PET bottles has been estimated to be around US$ 21,607.0 Mn in 2018 and is projected to expand at a CAGR of 4.1% by value, during the forecast period. PET bottles are an efficient and durable packaging solution for most of the end-use industries. Also, PET bottles offer a cost-effective solution for packaging. PET bottles are a highly-consumed product in the packaging industry owing to the rising demand from food & beverages, personal care & cosmetics, pharmaceuticals, and other end-use sectors. PET bottles are available in various volumes from 100 ml and 200 ml to 2000 ml & above. PET bottles can be custom-made as per requirement as well. The PET bottles market, on the basis of capacity, has been segmented into - up to 500 ml, 500 to 1000 ml, 1000 ml to 2000 ml, and more than 2000 ml categories. Among them, 500 ml to 1000 ml capacity PET bottles are estimated to account for nearly 53% of the global PET bottles market during 2018 and are supposed to maintain their dominance throughout the forecast period. It is attributed to the light weight of PET bottles. Manufacturers are continuously introducing improvements to reduce weight of PET bottles since the last few years. Their efforts are gaining traction with some manufacturers developing PET bottles that weigh less than 10 grams. This trend towards lightweight PET bottles is a result of cost-effective products and provides manufacturers a competitive edge over other players. 500 ml to 1000 ml PET bottles are highly used as a commercial packaging solution for carbonated drinks, energy drinks, edible oils, juices, and water bottles. The bottled water segment is gaining ground with a high demand across the globe due to the decline in the sales of carbonated drinks over the last decade. Hence, the prominent players are looking for opportunities in the bottled water segment to drive growth in the PET bottles market. The up to 500 ml segment of PET bottles is expected to be the second largest capacity segment in the global PET bottles market during the forecast period. Most of the energy drinks and juices are packed in these PET bottles owing to the growing trend of on-the-go consumption. This segment of the PET bottles market is highly sought after as a packaging solution by the cosmetics & personal care industry. PET bottles are an economical packaging solution for carbonated soft drinks, bottled water, edible oil, and other personal care & household products. The demand for PET bottles has grown significantly in the last 5-10 years due to the high growth in the consumption of convenient food & beverages in the developed as well as developing countries. Also, about 98% of PET bottles can be recycled, which makes them an environment-friendly choice for packaging of various products. In terms of consumption, the packaged water segment is estimated to overtake the carbonated soft drinks market as the most consumed beverage. The customers in the developed countries have become more health conscious and are switching from sugary soft drinks to healthier natural drinks. The volume sales of bottled water have grown at more than 10% in the past few years in the U.S., Germany, and Italy. The carbonated drinks segment has been witnessing a steady decline in sales for more than ten consecutive years, and beverage companies like PepsiCo and Dr Pepper Snapple, etc. are looking for opportunities in these growing segments of PET bottles end use. These factors drive the global demand for PET bottles market during the forecast period. In 2014, Coca-Cola boosted its share in the energy drink market by acquiring 16.7% stake in Monster Beverage, a manufacturer of energy drinks and juices. The factor which might hamper the growth of PET bottles market during the forecast period is concerns over the use of plastics bottles in most regions of the world. For instance, in October 2014, India introduced a ban on the use of PET bottles for the packaging of liquid oral drug formulations in the country. The ban covers the usage of PET bottles and containers for geriatric use, paediatric use, and by pregnant women and women in the reproductive age group. Similar regulations were imposed by various governments across the globe over the use of PET bottles. These factors are supposed to hamper the growth of the global PET bottles market during the forecast period. Key players which have been profiled in the report on PET bottles market include RETAL Industries Ltd., Plastipak Holdings, Inc., Resilux NV, ALPLA Werke Alwin Lehner GmbH & Co KG, Esterform Packaging Limited, Koksan Pet Plastik, Taiwan Hon Chuan Enterprise Co., Ltd., PDG Plastiques S.A.S, Zhongfu Enterprise Co Ltd., Alpha Packaging, Eskapet Pet Ürünleri Kimya San. ve Tic. Ltd., Manjushree Technopack Limited Co., Mpact Limited, Indorama Ventures Public Co., Ltd., Canyon Plastics Inc., and other PET bottles manufacturers. This report provides forecast and analysis of the PET bottles market at the global level. It provides the forecast from 2018 to 2027 in terms of revenue (US$ Mn) and volume (Mn Units). The global PET bottles market value is projected to clock a CAGR of 4.1%, during the forecast period. The report on PET bottles market reveals the dynamics of the PET bottles market in six geographic segments. The report comprises of the study of market opportunities for PET bottles manufacturers and includes an in-depth value chain analysis. To provide users of this report with a comprehensive view of the PET bottles market, the market study begins with an incisive executive summary on various segments, and their impact on PET bottles in the current market scenario. The executive summary also briefly discusses the key conclusions of the study as well as an overview of the PET bottles market. Furthermore, the role of the type of PET material used for PET bottles has also been discussed in brief. We have included a detailed competitive analysis and profiles of the PET bottles market players with a strategic synopsis. The dashboard provides an accurate comparison of manufacturers of PET bottles on parameters such as product offerings, total revenue, recent developments, key strategies, operating margin, and key differentiators. Among capacity type, the 500 ml to 1000 ml segment is expected to be the most dominating capacity type and accounts for nearly half of the total PET bottles market. In terms of end use, the food & beverages segment is the primary consumer of the PET bottles market during the forecast period. It is attributed to the feasibility of storing and transporting of products packaged under PET bottles. PET bottles market numbers have been assessed based on sales and the weighted average pricing of PET bottles taken by capacity. The pricing obtained through primary quotes from several regional manufacturers, suppliers, and distributors is considered for the calculation of revenue. To estimate the market size as per value and volume, the revenue generated by manufacturers and their corresponding production capacity has been taken into consideration. The PET bottles market has been analyzed based on expected demand and the current scenario. All the key end users of PET bottles have been considered from secondary sources and response taken from primary respondents. Country wise demand has been considered while estimating the PET bottles market for various end users. Top-down approach has been incorporated to assess the PET bottles market by country. Also, it should be noted that in an ever-fluctuating global economy, TMR not only conducts forecasts in terms of CAGR for PET bottles, but also analyses the market based on key parameters, such as year-on-year (Y-o-Y) growth rates, to understand the predictability of the PET bottles market and identify the right opportunities across the market. A number of primary and secondary sources were consulted during the course of the study of PET bottles market. Secondary sources include Factiva, World Bank, and the company’s annual reports and publications. The PET bottles market has also been assessed on the basis of segment-wise Y-o-Y growth rates. This detailed level of information is important for identifying key trends in the PET bottles market. The segments for the global PET bottles market have been analyzed in terms of their market share to understand the individual segment’s relative contributions to market growth. The market share is critical for evaluating the scope of opportunity that a provider can look to achieve, as well as to identify potential resources from a delivery perspective of the PET bottles market. The market share helps in analyzing segmental splits for the market in order to get better understanding of the PET bottles market.